First measure the diameter of each of the sockets. Draw a circle for each of the sockets, adding 0.02" to each diameter. This will let the sockets drop in easily while still keeping them from moving around too much. Make sure you are using a red line set to hairline width so that the laser cutter will know these are meant to be cut lines, not engraved lines. Now move each of the circles onto the same horizontal line, with a 0.1" gap between each circle. You can determine the center to center distance by adding the diameter of the two adjacent circles, dividing that by two, then adding 0.1". Because I had both 6 point and 12 point sockets I duplicated the entire row above the first row, with a 0.1" vertical gap between the biggest sockets. It turns out that a 5/32" 12 point 1/4" drive socket is pretty rare (and my set didn't include one). So I replaced that socket location with my 3/8" to 1/4" adapter. Finally, draw a rectangle around the socket holes. For a little more visual interest, I added 1/4" radius scalloped corners. All of the sections will be the same shape, so start by making a copy of the main body design. The magnetic strips will be embedded in the top of the base (so that they will be flush with the socket holes in the main body). Using the socket holes as a guide, draw two black rectangles where the magnetic strips will go. The magnetic strips are 1/2" wide, so make the rectangles 0.54" wide so they won't have an interference fit. Then delete the circles and fill the rectangle with black (use black to indicate that these rectangles will be engraved rather than cut). Although the text will be engraved on the side of the main body, start by adding the dimensions on top of each circle. These are each a simple text box, with a black line drawn to create the fraction. Then delete the circles and outer rectangle. Finally, draw a rectangle around the entire group of text that is the length of the main body. This will make it a little easier to align the text on the wood when using the laser cutter. Use a different color such as blue so that it will neither be engraved nor cut. Laser time! All three pieces cut well at 100% power and 0.25% speed. Although the walnut is much thinner than the poplar, it is harder to cut thus the same laser settings. To create the cavities in the base piece of walnut, make multiple engraving passes until the rectangles are deep enough to let the magnetic strips sit flush in them. In my case it took 4 passes at 100% power and 30% speed. Make a first pass at sanding all of the pieces. It is important to completely sand the burned surface off the middle body portion where the text will go. It takes a fair amount of effort to clear that off, and you would risk damaging the engraving if you had to sand it off after. You can do the sanding by hand, but it is much quicker if you have access to a bench top belt sander. The photo shows all three pieces rough sanded (I forgot to take a picture of the middle section before engraving, but I did sand it first). Stand the middle section of the body on its side in the laser cutter (I propped it up against another piece of wood to keep it stable). Now engrave the text onto the side of the body. The engraving worked well at 100% power and 30% speed. Although the magnetic strips have an adhesive strip on their backs, and the magnetic strips will be partially sandwiched between the base and the main body, I decided to epoxy them in as well. Mix a small puddle of 5 minute epoxy and spread it along all of the outer edges of each cavity. Press the magnets in and hold for five minutes. Be careful not to get any epoxy on your fingers. I flipped the base over onto a piece of parchment paper and pressed down until it hardened. Then epoxy the poplar middle piece on top of the base, then finally the walnut top onto that assembly. Now sand all of the sides until there is no overhang between the three layers of wood. Now apply a coat of spray polyurethane, let it dry, sand again, spray again, and repeat until you are happy with the finish. Now gather up your pile of sockets and put them in your new holder. The magnetic strips are not very strong, but will help keep the sockets from accidentally popping out when bumped or jostled. As you can see, they are just strong enough to hold the relatively small 1/4" drive sockets upside down if you are careful. For larger sockets either use stronger magnets (if you want to invert your holder for some reason), or just accept that the magnets will help keep them in place for normal use. Enjoy! One of the nicer projects! Could you provide the CAD file or STL file? 3D printers are becoming very popular now that the price and quality have improved. This would be an easy design to tweak for that application. Thanks. Looks beautiful and nice directions. Unfortunately it's not much of a DIY project if very, very few people have a laser cutter. It may as well be a CNC machine or a water jet. Maybe a good old drill press will do the job. I agree. It seems a lot of the projects found here lately involve CNC or laser cutters, or other gadgets that do all the work for you. I don't consider that workmanship at all. While the finished product here looks awesome, I'd rather see it made with a drill press, band saw, etc. I respectfully disagree. Laser cutters and CNC machines are just tools. They aren't magical devices but actually take a lot of skill, technique and perseverance to master. Yes, they make some tasks easier but it's a whole new skill set. Someone could argue a drill press or band saw is cheating and that one should really use a handsaw and chisel to provide true workmanship. I've built my own CNC machine and it's not magical. I understand the sentiment but this is an age old position that started with the industrial revolution. Laser cutters and CNC machines will only open up new ways of artistic expression and provide a bridge for students to learn new skills including the use of a drill press and band saw. I work in the manufacturing industry running CNC equipment and am trained as a manual machinist and I have to disagree. CNC equipment takes very little skill to operate, only knowledge. Anyone can be taught how to run a CNC, but manually doing things takes a feel that not all people have, similar to how some people can draw and others can't. I hate seeing people use complicated but easy to use tools to make simple items, where using hand tools and a little manual labor would result in the same end product, but with more value. That being said, great instructable! <i>CNC equipment takes very little skill to operate, only knowledge</i>. my point, put far more succintly. thinking and studying produce intelligence. action and experience produce wisdom. they are equally necessary, and neither is a substitute for the other. to confuse one for the other is often the source of many horrible accidents in industry. Anyone can *operate* a cnc machine. Our new guy (ged, never worked in a shop before) is decent after a half day of training. Setting up a cnc machine, programming it, troubleshooting, optimising, etc is not so easy. You have to have machinist and computer skills. Anyone who thinks starting with an idea in your head and ending up with perfect parts being ripped out at high speed on a cnc machine is easy, has never done it (or is a god among men, one or the other). But any amature woodworker could build this with a drill press, a table saw or band saw, and hand tools. I'd use the scroll saw i got for $20 at a yard sale, but that takes a little more skill and time (for a little nicer finished part). Technically, i have the tools and skills to build this with no power tools... but i wouldn't unless someone was paying top dollar for true hand-craftsmanship. Everyone can draw. Most just do not think that they can. Get a book called, Drawing on the Right Side of the Brain, and work through it conscientiously. I guarantee by the time you're done with it you'll be drawing better than you ever imagined that you could. That book will blow your mind! I can just about guarantee that too. It might even permanently alter your perception of yourself, and the rest of the world too. It is some freaky stuff. I've read another of her books, and meh, not as good as right side. I've read Nicolaides The Natural Way to Draw too, and it is essentially the same stuff, but much more drawn out. I have to recommend Right Side over it, as I feel the material is presented better there. But if Right Side leaves you looking for more then try The Natural Way, because it is a much longer course. So more is certainly what it has to offer. Just bought it. Thank you sir. Well let me know how it works for you. I have to say it certainly surprised me. The machines may be easy to use with a little know-how, I was speaking to the fact that most people don't have a $20k+ machine in their garage/workshop. Maybe it's just me but I see inscrutable's as being meant for DIY projects that can be completed for cheaper than buying a similar commercially sold product. Very few people work at a shop where a laser cutter is available for personal use. As nice as the finished product is, I would gladly pay a decent price for a few of them made via laser cutter or take time and make one on a drill press. I've seen cribbage boards that look similar that were made with a drill press so I know it's doable. yes. and as an actual engineer building a lathe in my garage right now, they are just tools. however, when i was learning how to draft, long ago, my instructor was old school enough to encourage all of his students to take machine shop classes, because something neat on paper doesnt always work well in the real world. i was the only one who followed his advice, and in that machine shop, file in hand doing benchwork, i learned more about mechanical engineering in a month then in my entire time in school. with all due respect, ive yet to meet a cnc advocate make similar statements that possesses the skill enough with handtools and small powertools to produce quality work. and many shop teachers will tell you that the proliferation of cnc machning has turned today's machinests into button pressers, little more skilled then the button pressors at mcdonalds. at the same time, this is a beautiful project. there is no shame in using the best tools one has access to. dont player hate if you cant participate - save your pennies and harbor freight coupons for your own lathe. 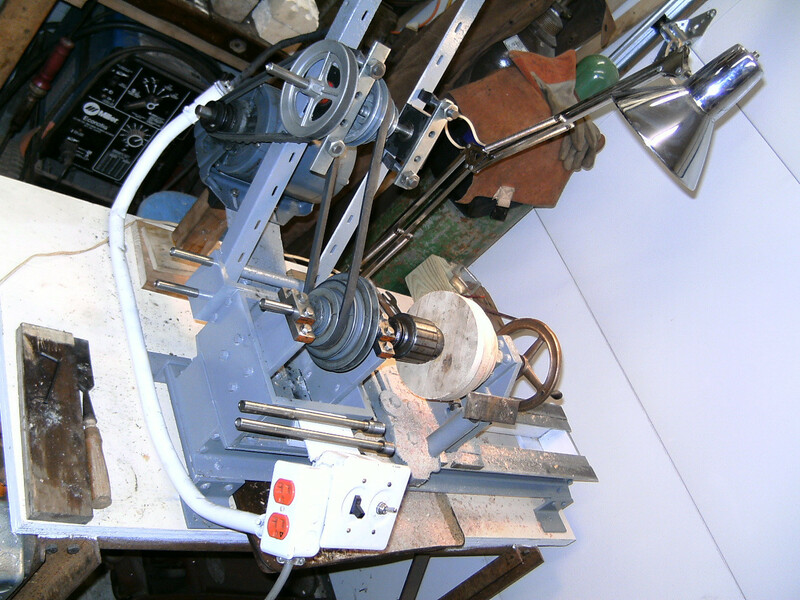 I've made a couple of wood lathes. If I beef up the spindle on my last one, and make a carriage for it, I might even be able to do a bit of metal working on it too I think. At least that was the plan a while back. Someday maybe. If you show me yours I'll show you mine. 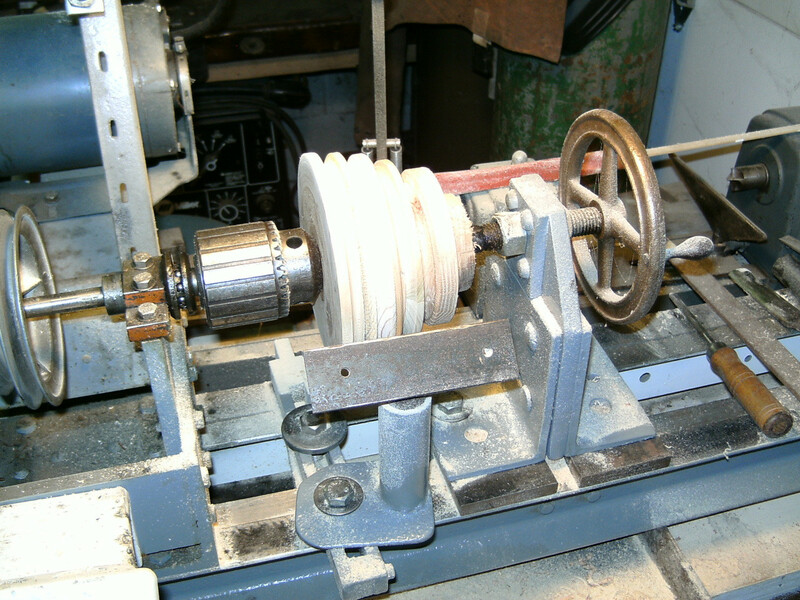 Homemade lathe that is. It took me a while to put that one together. Many of us used hand tools and basic machines to be able to read a level where we can afford access to and know how to run cnc machines. While you may argue that CNC operators are just button pressers, you need to know how to machine effectively before you can tell the machine how to do it by itself, and know what is happening in order to troubleshoot when things go wrong. The reason yo see more projects liek this is because more people are gainng access through Techshops and make spaces to machines that either help them make interesting objects, or help them build their own tools. About 20 years ago, I use to operate a 5'x10' bed CNC router in a high end cabinet shop. We made all the store fixtures for over 500 Sports Authority stores. 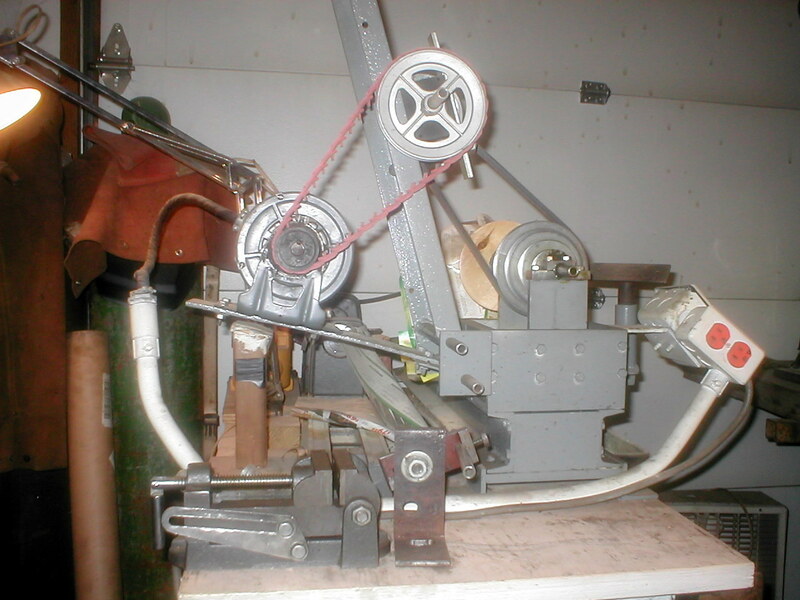 Once the pattern was made, I set up the vacuum table, loaded the wood and pushed a button. It's chimp work. It's a great tool for production. But it's not woodwork. At Disney almost 30 years ago I saw a CNC Airbrush tshirt painting machine. Would you call those t shirts it produced "art"? Gotta love the 20% off coupon at HF, as long as you know what to get and what to stay away from. This argument has 2 sides. We all use tools in the production of our 'products'. Being a woodworker for several years that has migrated to CNC, I can understand the point of the 'purists'. However with CNC, you are designing your project on a PC where we all used to do it on graph paper. I design on PC, to the same tolerances as I did by hand. Both sides need the same spacial visualization capabilities to produce a quality product. Like it or not, the computers are invading all facets of our lives, why not in woodworking (or other mediums) as well. It will only become more pervasive as time marches on. I both agree and disagree. This could easily be replicated with hand tools but its a very cool idea that I would not have though of had I not seen it here. I agree though lately Instructables has been becoming saturated with things made at tech shop and with complex machinery (3-d printers, CNC etc.). Guess it just means we have to be more creative in the execution lol. Having made a couple of socket holders manually using a milling machine as a drill press I have to say it is somewhat of a pain to do. For each drive the larger size sockets are all different diameters. So that means a lot of bit changes. You also should drill flat bottom holes to hold the sockets in, and drill them to a uniform depth too.